Dieter Thomas Heck (born Carl-Dieter Heckscher; 29 December 1937 – 23 August 2018) was a German television presenter, singer and actor. He is known as the presenter of the popular TV program ZDF-Hitparade, featuring German Schlager music, from 1969 to 1984, reaching millions of people. As an actor, he starred in the TV play Das Millionenspiel in 1970. Heck was born in Flensburg, Germany and grew up in Hamburg. In April 1943, when he was five years old, he developed a stutter after being trapped under a staircase after a nighttime British bombing raid during World War II. The stutter went away after he received training in classical singing at age 16. After completing "Mittelschule" (middle school) and a technical "Oberschule" (high school) he was trained as a "Technischer Kaufmann" (technical salesman) by Borgward in Hamburg and worked afterwards as a salesman. He left the company after four years. In 1959, Heck appeared on Peter Frankenfelds talent show Toi – Toi – Toi, singing Hippe-di-hipp, mein Mädchen. In 1961, he participated in the preliminary round of the Grand Prix Eurovision de la Chanson (now Eurovision Song Contest). After employment as a car salesman, Heck worked for a record company. He visited the radio station Südwestfunk (SWF) in Baden-Baden on 23 November 1963 and was asked to be interviewed because a scheduled guest did not show up. The moderator asked clumsy questions so Heck took over conducting the interview himself. As a result, Herbert Falk offered him the job of hosting a 90-minute "Sendung" (broadcast) every Saturday. Heck then worked for Radio Luxemburg from 1965 to September 1966. It was customary there to use only a first name, and as "Dieter" was already taken, Heck asked readers of the youth magazine Bravo for an alternative name. The readers chose "Thomas", and he has used it since. He collaborated with Frank Elstner and they became friends. He then worked for SR 1 Europawelle of the Saarländischer Rundfunk. He concentrated on German Schlager music, a topic not favored by other moderators. His series Die Deutsche Schlagerparade was so successful that it was partly recorded. 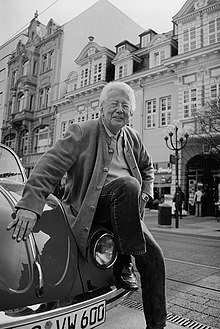 In 1967, he was a co-founder of the award Goldene Europa for German singers, which was first awarded in 1968. Heck's breakthrough came with ZDF-Hitparade, a TV series for the ZDF in Mainz, based on the model of the Schlagerparade and staged by Truck Branss. It was considered an influential music feature of the 1970s and 1980s. He presented it 183 times between 1969 and 1984. He showcased international performers, but they had to sing in German, including the Libanese Ricky Shayne, the Greek Costa Cordalis, Bata Illic [de], Mireille Mathieu, Mouth & McNeal, Karel Gott, Michael Holm and Marianne Rosenberg. Heck initiated the award Goldene Stimmgabel. From 1982 to 1989, he was also moderator for the Südwestfunk in the series Gute Laune aus Südwest and Vom Telefon zum Mikrofon. For the ZDF, he moderated 4 gegen 4 (1973), Die Pyramide (1978), Schwarz auf Weiß, Ihr Einsatz bitte – Made in Germany, Das ist ihr Leben (1994), Das große Los, Showpalast, Das Sommer-Hitfestival, Das Silvester-Hitfestival and finally Melodien für Millionen (Melodies for Millions), a gala for the benefit of the German Cancer Aid. He retired from the ZDF in 2007. He said then "It was my life to entertain people. That I succeeded makes me happy. "("Mein Leben war es, Menschen zu unterhalten. Dass mir dies gelungen ist, macht mich glücklich"). Heck published his biography in 2011. As an actor, in 1970 he starred in the role of the showmaster in the TV play Das Millionenspiel. He played supporting roles in TV crime series, such as Tatort in 1981, Rosenheim-Cops, Praxis Bülowbogen, and SOKO Stuttgart in 2009. Heck married in 1962 and again in 1976. He had two sons and one daughter. He died on 23 August 2018 in Berlin. ^ a b c "Der Nachkriegsdeutsche / Dieter Thomas Heck personifizierte die „ZDF-Hitparade" und war der Showmann der Wohlstandsjahre. Mit 80 Jahren ist er nun gestorben". TAZ (in German). 25 August 2018. Retrieved 27 August 2018. ^ a b c d e "Dieter Thomas Heck". filmportal.de. Retrieved 7 March 2012. ^ a b Zylka, Jenni. "Dieter Thomas Heck "Zigarette und Bierglas, zack. Das war schon heavy"" (in German). Spiegel Online. Retrieved 9 March 2012. ^ Scheuring, Christoph (1995). "Der Parade-Deutsche". Der Spiegel (in German). 8: 78. Retrieved 23 April 2012. ^ a b c d "Vom Stotterer zum Schnellsprecher" (in German). Nord Bayern. 27 December 2007. Archived from the original on 12 February 2013. Retrieved 11 March 2012. ^ a b c Hildebrandt, Antje (21 June 2007). "Ötzi konnte schlecht singen" (in German). Welt Online. Retrieved 10 March 2012. ^ a b c Thomann, Jörg (25 August 2018). "Zum Tod von Dieter Thomas Heck /er Schnellsprecher". FAZ (in German). Retrieved 27 August 2018. ^ a b c Preißner, Katja. "Dieter Thomas Heck – Die Biografie" (in German). Saarländischer Rundfunk online.de. Archived from the original on 12 February 2013. Retrieved 9 March 2012. ^ "Juliane Werding – Wenn Du denkst Du denkst, dann denkst Du nur Du denkst". Half Heart Dude. Retrieved 19 April 2012. ^ a b c d e f g "Fernsehlegende - ZDF-Moderator Dieter Thomas Heck gestorben" (in German). ZDF. 25 August 2018. Retrieved 27 August 2018. ^ Isert, Jörg (28 December 2007). "Der Dieter, der Thomas, der Heck". Stern (in German). Retrieved 25 April 2012. ^ "Das Millionenspiel (1970)" (in German). Internet Movie Database. Retrieved 25 April 2012. ^ a b "DMV trauert um Dieter Thomas Heck". Deutscher Musikverleger-Verband (in German). 27 August 2018. Retrieved 27 August 2018. ^ a b c d e f g h i j k Riedmeier, Glenn (24 August 2018). "Dieter Thomas Heck ist tot". wunschliste.de (in German). Retrieved 27 August 2018. ^ a b c "Lebenswerk National: Dieter Thomas Heck". Goldene Kamera (in German). Retrieved 4 March 2017. Peter Lanz: Dieter Thomas Heck – Die Biographie, Edel Books. Hamburg 2011. ISBN 978-3-8419-0101-9. Wikimedia Commons has media related to Dieter Thomas Heck.